Pickles are considered a “take it or leave it” addition to a meal for most people. The majority of people either absolutely love pickles or hate them with a fiery passion. Pickles come in all shapes, sizes, and flavors. I might sound a bit like Bubba Gump from the Forrest Gump movie when I say this, but pickles can be sweet, savory, spicy, tangy, crunchy, crinkly, and sour — and the list goes on! Pickles are an affordable, low-calorie snack that can easily be eaten on the go (they even sell little to-go cups of pickles in some grocery stores). Some celebrities, like Selena Gomez, have boarded the pickle train as well. Selena even has pickles delivered to her from her hometown! Although some people appreciate the tasty benefits of chomping down on pickles, what about the pickle juice that is typically discarded carelessly? Pickle juice may not be on your radar as something worth using, but take a look at the five everyday uses for pickle juice. Number two will surprise you! Catching a cramp can feel like hell on earth. A bad cramp has made us all revert back to our childhood wailing at some point. Feeling the onset of a muscle cramp will make you immediately grip your body in excruciating pain while you silently berate yourself for not drinking enough water or stretching properly. Muscle cramps are typically caused when someone doesn’t consume enough water to replace the amounts of water that are lost in everyday activities, such as working out. When you sweat while exercising, you lose a lot of salt from your blood. These salts are called electrolytes. Most people don’t hydrate enough to replace the amount of fluid that is lost during exercise, causing major fluid and electrolyte depletion, which creates sensitization of select nerves resulting in muscle cramps. Pickle juice can help prevent dehydration during your workout, which will help your body reduce fluid loss, maintain workout performance, reduce heat stress, and fight fatigue. Now that’s a workout booster! Studies show drinking small amounts of pickle juice relieves muscle cramps within 35 seconds of ingestion. Scientists believe the vinegar in pickle juice helps muscles to stop contracting, which causes the muscles to relax. Next time you feel a horrific cramp coming on, try drinking pickle juice from the jar or give this pickle sports drink a try. Alcohol can contribute to severe dehydration. When you’re out having a great time, a hangover is probably the last thing on your mind–but once you experience it the next day, a hangover will make you wonder why you decided to ever drink in the first place! Hangovers can cause nausea, headaches, and massive amounts of vomiting. If you’ve ever asked for advice on how to cure a hangover, you’ve most likely been told that water is essential for fighting those dreadful symptoms. Hydrating your body with electrolytes can help significantly reduce the intensity and length of your hangover. When electrolytes are consumed by your body, they dissolve into positive and negative charges. The two charges help regulate the flow of water in and out of cells, and spark nerve impulses. Some people rely on electrolyte enhanced water, coconut water, or sports drinks to get their daily dose of electrolytes but pickle juice is the underdog that rarely gets recognition for its electrolyte enhanced benefits. Since pickle juice increases plasma electrolytes, it makes the perfect drink to ease your hangover. 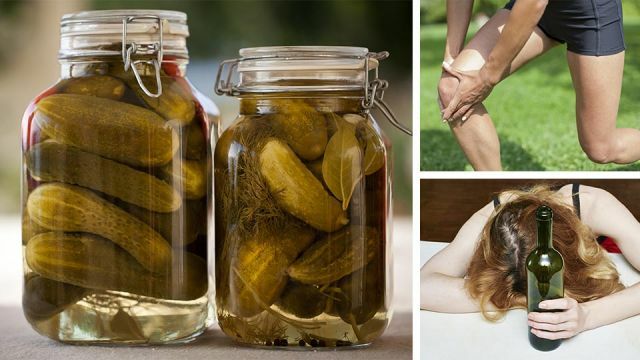 Pickle juice isn’t just for regular cramps, it can also alleviate PMS complications, like period cramps. The vinegar found in pickle juice has probiotic effects that encourage the growth of good bacteria and flora in your stomach. The brine in pickle juice also helps settle an upset stomach. An added bonus is that pickle juice might hit the spot for any period related cravings caused by PMS symptoms. A taste of pickle juice could be exactly what you need to banish your period woes. High blood sugars levels can be deadly for people suffering from type 2 diabetes. Drinking a small amount of vinegar has been known to regulate blood sugar levels after a meal. Because pickle juice contains vinegar, it acts as a regulator for blood sugar levels, especially for people with type 2 diabetes, according to research in the Journal of Diabetes Research. The vinegar in pickle juice also helps improve the body’s response to insulin. Lowered blood sugar levels can also help ward off other conditions, such as heart concerns and kidney damage. Everyone frets about the idea of getting wrinkles. For most people, it’s a sign of getting old (cue the tears!). That’s why the beauty market successfully sells truckloads of anti-wrinkle beauty products every day. However, you don’t need expensive beauty products to battle the onset of wrinkles. Vitamins C and E naturally fight wrinkles and are found in pickle juice! Pickle juice contains antioxidants that will keep your skin radiant. Not only will the vitamins found in pickle juice keep you looking youthful, they can also improve your immune system for an overall healthier appearance. Applying pickle juice directly to your face can serve as rejuvenation therapy due to the high amounts of vitamin c. Ingesting pickle juice can increase your vitamin intake and help cure vitamin deficiencies, which contribute to skin disorders. Pickle juice probably isn’t the first thing that comes to mind when you think of beneficial drinks to incorporate into your everyday routine. Although it’s not as popular as other methods, you should consider using pickle juice for its added vitamins, anti-aging benefits and to get rid of painful cramps. Have you ever used pickle juice before? If so, what was your experience? Leave your comments below! Hey Buddy!, I found this information for you: "5 Benefits of Drinking Pickle Juice". Here is the website link: https://www.thealternativedaily.com/4-benefits-drinking-pickle-juice/. Thank you.